Congratulations to Danny Willett on winning the 2016 Masters Tournament. Willett played a Callaway SR3 golf ball in this year’s tournament, however 100 years ago, he would have hit a Haskell golf ball. In 1898, Coburn Haskell, an avid golfer from Cleveland, and Bertram Work, an employee of the B.F. Goodrich rubber company in Akron, invented the modern golf ball. The legend goes that Haskell and Work were planning on playing a round of golf together. Haskell was waiting in the B.F. Goodrich plant for Work to finish up. Haskell found some rubber thread and wound it into a ball. He bounced the rubber ball and almost hit the ceiling. 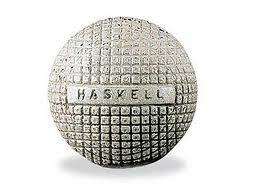 Work suggested that Haskell put a cover on the ball and the birth of the modern gold ball was born. The first golf balls were leather pouches stuffed with boiled feathers. However, these were often expensive and difficult for players to hit. Haskell and Work’s ball consisted of rubber thread wrapped around a solid rubber core. This golf ball was much easier for golfers to hit and allowed for greater control. As a result of Haskell and Work’s invention, golf’s popularity skyrocketed in the 20th century. Bobby Jones, one of the greatest golfers of all-time, described the Haskell ball as “the most important development in golf”.